President Donald Trump announced on Friday evening that he would put on hold the Interior Department’s controversial decision to lift two elephant trophy bans. Interior Secretary Ryan Zinke issued his own statement later on Friday confirming Trump’s announcement. The U.S Fish & Wildlife Service announced on November 16 that it was rolling back an Obama-era ban preventing the import of hunted elephants in Zimbabwe. A similar ban had also been lifted for hunted elephants in Zambia. The decision was met with overwhelming backlash, with both liberals and conservatives slamming the move as needlessly cruel and inhumane. The notorious photos of the President’s sons posing with a dead leopard and a dismembered tail of a elephant from their hunting expeditions didn’t help. According to the Service, it can allow such imports “only when the killing of the animal will enhance the survival of the species.” African elephants are protected as an endangered species under the Endangered Species Act, and critics questioned the Interior Department’s defense that allowing hunters to kill more of them would enhance their survival. 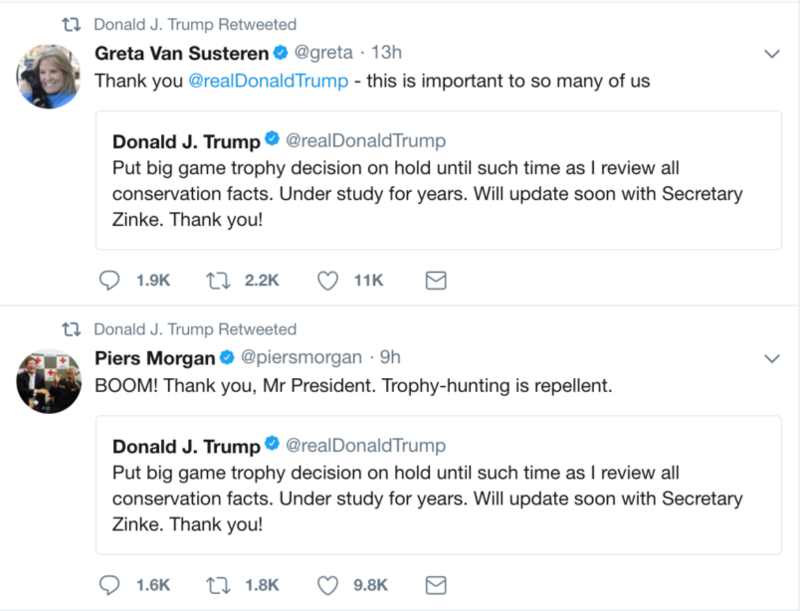 On Saturday, Trump seemed to enjoy the positive response to his announcement, re-tweeting Piers Morgan and Greta Van Susteren thanking him for his decision.